Shifty Shafts is a mine shaft area towards the South West corner of the map in Fortnite’s Battle Royale mode. It can be found between Greasy Grove and Salty Springs. Shifty Shafts is usually a very quiet area to drop, as there isn’t much around. It also isn’t too far from Tilted Towers, so it’s good to go pick people off after. In this post, we’re going to show you each chest location in Shifty Shafts, helping to maximise the amount of loot and rewards you can find! In total, there are 12 chests in the general area. Although just 7 are actually in the mine shafts. 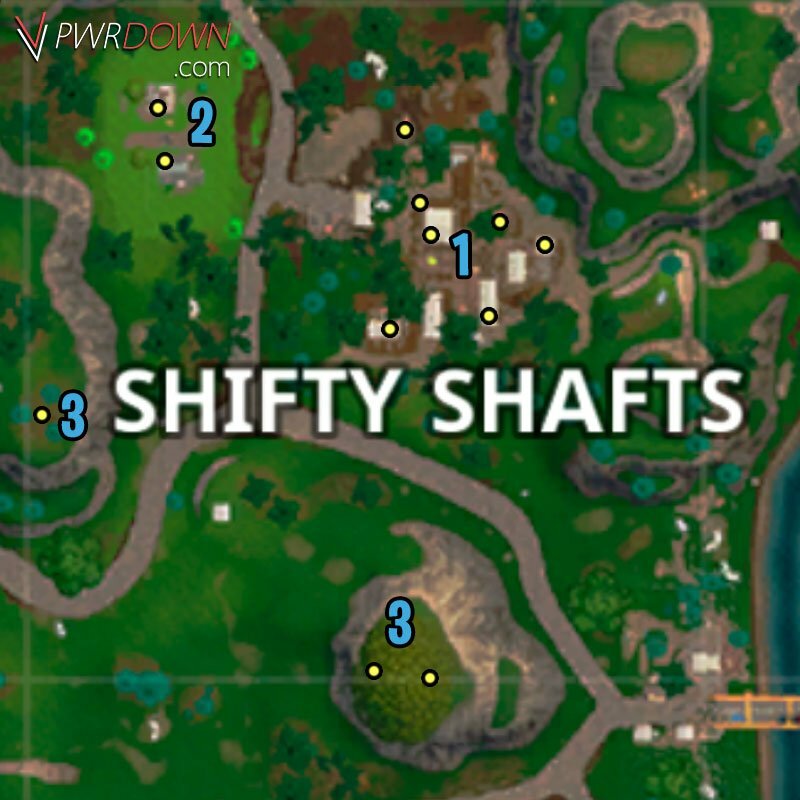 For the first area, marked with a Number 1 on the map, you will find the main part of Shifty Shafts, which is the mining area. In this location, you can find up to seven chests. This area is quite complex, due to it consisting of multiple levels, so you may have to spend a while looking for each chest. Around half of the chests are above ground, whilst the other half are below. The mines can be confusing, as well as finding chests. Other chests can be found inside the back of a truck, and in the roof pieces of small buildings. At the second location, marked with a Number 2 on the map, we have two buildings. One is a house, and the other one is a large shack like structure. You can find two chests in this area. Both chests are located in roof sections, one inside of each building if they spawn at all. These chests are obviously isolated from Shifty Shafts, so it might be worth getting them before or after the main area. Finally, Number 3 on the map consists of two locations. That’s because there are 3 more chests available, but they are separated quite a lot. The first chest is located on top of a mountain to the West of Shifty Shafts. It can be a nightmare to get to, so you will need to decide if it’s worth going for. Whilst the final two chests can be found South of the mines. These two chests are also on top of a mountain, sitting on the grass around the tree.